Need more information about booking Home 7279290 ? 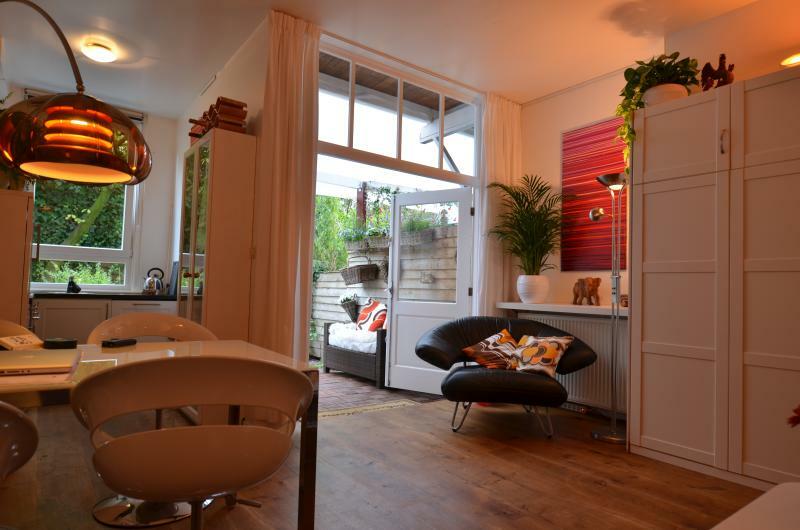 Our ground floor apartment with private entrance has a small sunny garden situated in the popular old south neighborhood "de Pijp''. The apartment has one bedroom, one bathroom and a modern build in kitchen with view over the garden. With a oak wooden floor and a 60/70 space age style interior my Sweet home feels warm and modern retro. The living room has an bed closet which is easy to take out and change in a second bedroom. And sliding room dividers for privacy. Television, Go-play Bluetooth sound system, beamer and free WiFi. Perfect for two couples or family with two kids. The guest have access to all rooms and garden and may use all kitchen facilities. Breakfast consist of fresh bread and all that is in the refrigerator. Smoking is not allowed inside the apartment but can be done in the garden. No visitors or pets unless agreed upon with the owner. Treat our house with respect but enjoy your stay. Keep in mind it is in a residential area so no loud music, drugs and parties. We are near the property to help you. Treat our house with respect but enjoy your stay. Smoking is not allowed inside the house but can be done in the garden. Keep in mind its in an residential area so no loud music and parties. You can get in touch with Sandor (the owner) through the contact form on this page. Send Sandor (the owner) an email through the contact form on this page. Alternatively, if there’s a phone number on this page, you can call them. How do I contact Sandor (the owner)? If you’ve already booked, go to Manage your holiday booking to view Sandor the owner's contact details or send them a message. Or send Sandor (the owner) an enquiry through the Contact the owner/manager form if you’d like a quote or more info first. When you pay online through the Book your stay form, a booking request is sent to Sandor (the owner). You’ll find out within 24 hours whether they’ve accepted - no money will leave your account before then. You can also request a quote from Sandor (the owner) through the contact form. The owner will email you the total cost for your dates and a link to book and pay online. Use the Book your stay form to pay provisionally online. You can pay by credit/debit card or PayPal. Sandor (the owner) will have 24 hours to accept the booking and no money will leave your account before then. Why can't I call Sandor (the owner) before booking? You’ll need to contact Sandor (the owner) to do this. Send them a message in Manage your holiday booking or through the contact form on this page. You can request to change the dates or number of people on your booking via the Manage your holiday booking page. To change your holiday dates use the Edit booking button. If you need to change the number of guests staying then send Sandor (the owner) a message. If Sandor (the owner) agrees, they’ll send you a revised quote outlining the changes. You can review and accept/decline this from the Manage your holiday booking page. You’ll have 48 hours to take action before the revised quote expires.